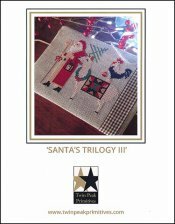 Santa's Trilogy 3 [D6347] - $12.00 : Yarn Tree, Your wholesale source for cross stitch supplies. Cross stitch pattern by Twin Peak Primitives. Look who is arriving at your doorstep this Christmas, Santa & Mr. Llama! Dressed in his red coat, carrying his walking stick & his lantern on his arm..Santa is guiding the way. It's important they get all of the presents. With a Christmas wreath around his neck & a Christmas quilt block blanket on his back, Mr. Llama is ready to visit all of the boys & girls. Mr. Chicken, of course, didn't want to be left behind! Merry Christmas! Stitch count is 74W x 66H.